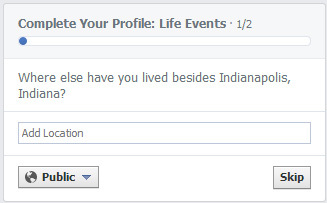 This showed up today and made me ask, why would Facebook just assume that I’ve lived somewhere besides Indianapolis, Indiana? Yes, it seems like few around here were actually born here. And many people try to leave, but they always end back here. But that’s no basis to just assume one is not from here. Technically, I was not born in Indianapolis, even though I was born in Marion County, Indiana. And technically I have lived outside of Indianapolis proper for 7 months of my entire life, but those 7 months were spent in southern Boone County. Yet both of these places would be considered “the Greater Indianapolis Area”. What places should I list as living at besides Indianapolis or the surrounding areas? I’ve spent a lot of time in Tennessee & Florida. Or I’ve spent less than an hour in both Denver and Phoenix (assuming the airports actually are in city proper). What do you think? Disclosure: I do hold FB stock, but merely to keep tabs on things and to have a say, as extremely minute as it may be.